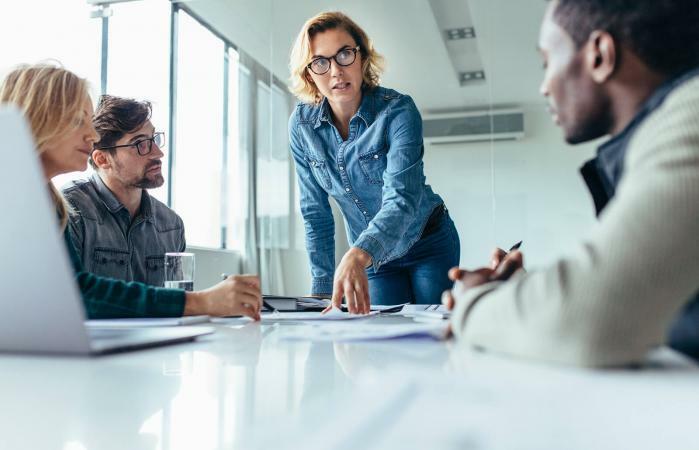 While working as a project manager does require a degree of technical expertise related to the type of work being performed, there are a number of tasks and duties common to most job descriptions for project managers. The attached sample job description is a good starting point for understanding what's typically involved in this kind of job. While there are many similarities among most project management jobs, the exact work performed can vary greatly based on industry and project type. For example, the daily tasks performed by people who are project managers on construction projects are very different from those who manage marketing or shipbuilding projects. The attached printable job description can easily be customized to be specific to the needs of particular industries and organization. 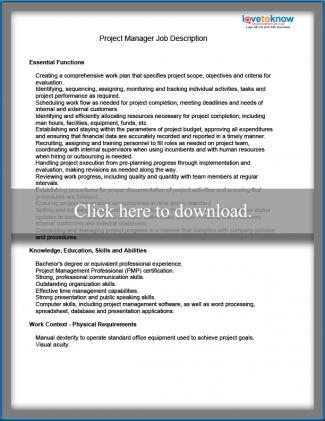 To access the printable project manager job description, simply click the image. The job description will open as a PDF file that you can view, print, edit and save. Depending on your browser settings, the document will either open as an independent file or in a browser window. If you need help downloading the printable description, check out these helpful tips. Rather than starting from a blank document to create project manager job descriptions for your company, you can easily adapt the document provided here to meet your purposes. Simply keep what applies, remove what doesn't, and add details specific to your company's needs. Review the essential functions listed on the job description very carefully to determine what needs to change, editing accordingly. When you have made the necessary changes, save the document using the "Save As" command from the File menu or by clicking the diskette icon on the menu bar. Once you have saved the document, you will be able to make further edits any time changes are needed. Print the document for proofreading or distribution by selecting "Print" from the File menu or by clicking the printer icon on the menu bar. Review the job description carefully before distribution. Verify that it accurately reflects expectations and requirements for your company's project managers and have it reviewed by legal counsel before finalizing. Once you are certain that the document is correct, distribute it to the project managers who are already working for your company and use it as a screening tool when hiring for new positions. Be sure to give a copy to each person that you hire to work as a project manager, so that new hires will clearly understand the company's expectations.